With the addition of Cody Ceci, Owen Sound Attack GM Dale DeGray just enlivened one of the OHL's big city-small city rivalry. The London Knights are running away with the league lead and might have liked Ceci, the best available defenceman who comes without NHL call-up strings attached, running their power play. However, DeGray and the Attack, representing the OHL's tiniest market, have landed the Ottawa Senators first-rounder in a reported four-player trade. In other words, Owen Sound, which holds the third seed in the Western Conference but is 18 points back of London, believes it could take dead aim on the Knights come playoff time. It's not a surprise since Ceci matches the description of the "defender with good to above average mobility and puck movement skill" whom DeGray believed he was close to adding to his blueline. Ceci's image might have suffered due to his omission from Canada's national junior team selection camp and the 67's bottoming out in the standings, but he's remained nearly a point per game scorer on defence. The Attack also have the blueline depth — overages Nathan Chiarlitti and Keevin Cutting, Tampa Bay Lighting draftee Jake Dotchin and stellar sophomore Chris Bigras — to help share the back-end workload. So it's the quintessential trade that should work for two teams at different stages of their development. 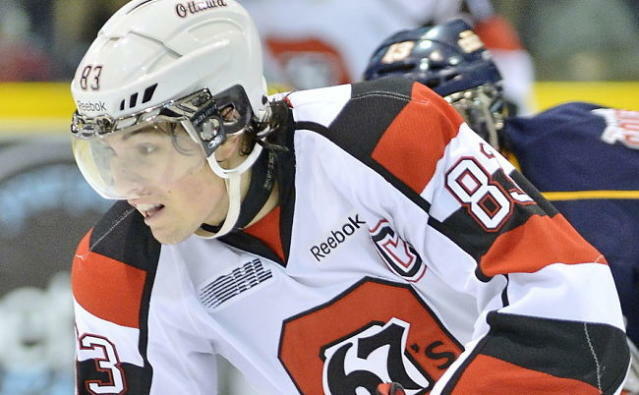 Janes is a two-way wing with good size who could fit in well playing in Owen Sound's smaller rink. It's also possible that getting New Jersey Devils-drafted forward Artur Gavrus meant Owen Sound was less reluctant to move Blandisi, a Colorado Avalanche pick who was their fourth-leading scorer. One should probably not get hung up on the fact that GM-coach Chris Byrne threw in the third-rounder as the sweetener on a 2-for-2 swap. Having Middleton for 3½ seasons could be worth it. The Stratford, Ont., native is coming off a solid showing with Team Ontario at the World Under-17 Challenge last week. He essentially was the third-highest priority selection pick in his 1996-born peer group after the Barrie Colts' Aaron Ekblad and Kingston Frontenacs' Roland McKeown. Ottawa, of course, is a situation that many outsiders would view as tempting to tank, land the No. 1 overall pick and possibly draft the exceptional Sean Day. They are tied with the Peterborough Petes for dead last in the OHL (with two fewer games to play, 26 left to the Petes' 28). The fact Byrne has added two 18-year-old forwards in the past few days, Blandisi and Sergey Kuptsov, suggests the 67's plan on holding on to star centre Sean Monahan, who should be a NHL first-rounder this summer. Byrne would have opted for picks if he was embarking on a long, two- or three-season rebuilding plan. Ottawa's two trades have replenished their 19-year-old depth for 2013-14, pending whether Monahan returns or goes directly to the NHL. Meantime, between Middleton and centre Dante Salituro, they have two projected building blocks for farther down the line. The Senators surely had some say in Ceci's destination. Owen Sound isn't a surprise in that regard. Senators assistant coach Mark Reeds coached the Attack two seasons ago, while the Sens also traded Attack forward Jarred Maidens last summer. The Ceci trade is the first skate to drop involving a Western Conference contender. It might be a prod to action for London and everyone else in hoping to play late into the spring. Now that Ceci deal is official, should heat up Western Conference arms race.